Camellias are generally planted in the late fall through the early spring, although they may be set out any month of the year if properly cared for. Choose a planting site with well-drained soil. Do not plant where shade trees with shallow root systems will compete with camellias for nutrients and water. Plants in the sun may suffer scald on the leaves or leaves may appear yellow rather than deep green. Plants of Camellia sasanqua generally do better in the sun than those of C. japonica. Camellias will grow in most well-drained slightly acid soil. 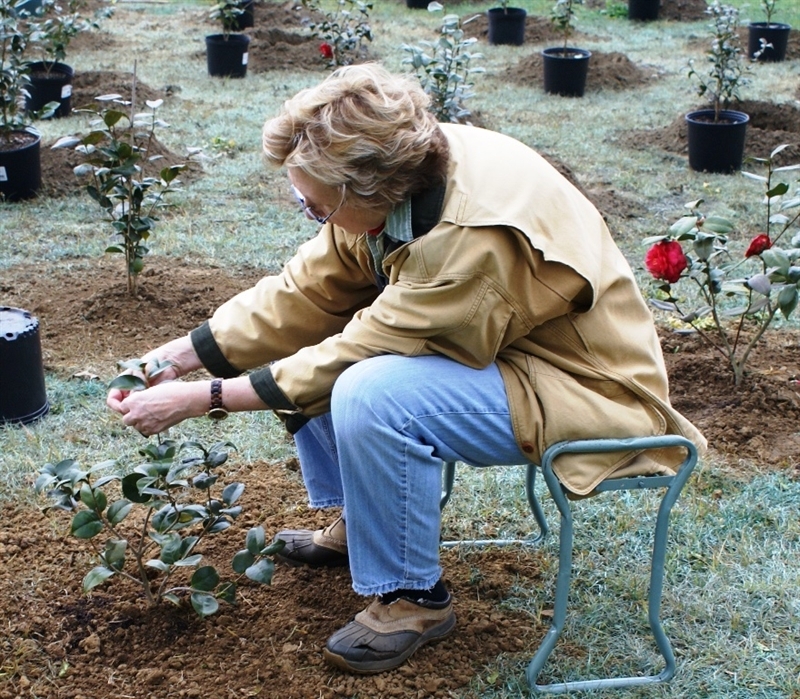 A soil pH (degree of acidity or alkalinity) of 6.0 - 6.5 is considered best for camellias. However, they will tolerate a lower pH. A soil test made before planting will tell you what is needed to bring the soil to the desired pH and fertility level. Practically all soils will benefit from the addition of organic matter when planting. Two to four inches of peat moss, leaf mold, ground aged bark, sawdust or cow manure worked into the soil improves both the drainage and fertility of the soil. Camellias are generally planted in the late fall through the early spring, although they may be set out any month of the year if properly cared for. Adequate moisture is a necessity until the roots become well established in the soil. The newly developed roots will then provide enough moisture for the plant to start growth when spring arrives. Allow a minimum of five feet between plants, and preferably more. When planting a hedge, a distance of three feet between plants is recommended. The following steps should be followed when planting a camellia. Dig a hole at least two feet wider than the root ball. Leave soil in the center of the hole undisturbed to prevent settling. Place the rootball on a the column of soil in the center of the hole. The top of ball should be slightly above soil level. When planting a container-grown plant, wash away the soil from the root ball with a water hose and rough up the root ball, if tight, to allow better penetration into the soil. Fill the hole around the root ball with a mixture of topsoil and organic matter. Build a berm of soil around the plant three feet in diameter to prevent water from running off. Mulch with straw or other organic matter around the plant. Water well after planting and soak once a week during dry weather. The State Extension Service no longer recommends the addition of organic matter to the backfill soil. Research has shown that this does not improve plant growth. They now recommend digging a wide hole and refilling with the removed soil.